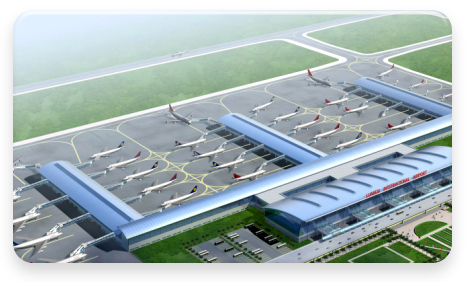 • The African Aviation Tribune •: ■ ANGOLA: Government to spend EUR1.6billion on aviation infrastructure by 2016. In his remarks at the recently ended 4th China & Lusophone Countries Airport Conference in Macau, Mr Ceita said the investment in infrastructure was in line with ENANA's long term vision. Since January 2009, ENANA has been working on the construction, rehabilitation and upgrading of more than 30 airports and runways countrywide. New airports that have opened include those in Huambo, Cuito Cuanavale, Soyo (Zaire Province), Uige, Dundo (Lunda Norte Province), Saurimo (Lunda Sul Province) and Luena (Moxico Province). Among the biggest of the projects though is the construction of Luanda's new Angola International Airport being undertaken by a consortium of Chinese companies and Brazilian company, Odebrecht. The facility will entail a terminal building 160,000m² in area with a throughput capacity of up to 13.152 million pax/annum, and a 6,200m² cargo terminal capable of handling 35,000 tonnes per year. ANGOP reports Ceita as saying the development of the aviation sector in Angola has an important basis in cooperation with Portugal, notably with the Portugal's air navigation services provider (Navegação Aérea de Portugal – NAV) which "has accumulated experience and extensive knowledge to spread throughout the world."